The Russian Embassy in Washington replied that the diplomats "were grateful for the congratulations"
WASHINGTON, June 16. /TASS/. The US Department of State has eventually delivered its congratulations on the occasion of this year’s Day of Russia, three days after the country celebrated its national holiday on June 12. "On behalf of President Trump and the American people, I congratulate all the people of Russia on the occasion of this year’s "Day of Russia," US Secretary of State Rex Tillerson said in a congratulatory note posted on the Department of State’s website on Thursday. "The relationship between the United States and Russia stretches back to the early days of our republic. Today, our countries share unique responsibilities to uphold international peace and stability, and to cooperate on issues of global importance," he said. "We believe we can best do so when we stand together to support the fundamental values of human dignity and freedom," the note reads. "As you celebrate the Day of Russia, know the United States stands with you in honoring your independence as a nation rich in tradition and full of possibilities." The Russian Embassy in Washington replied that the diplomats "were grateful for the congratulations" and "will hand it over to the intended recipient." The fact that Washington failed to deliver its official congratulations to Russia, which is a standard diplomatic practice, first came into spotlight on the day of the celebrations. A spokesman for the US Department of State explained to TASS that the move was due to the Trump administration’s new procedure, according to which official congratulations are delivered via US embassies in respective capitals. 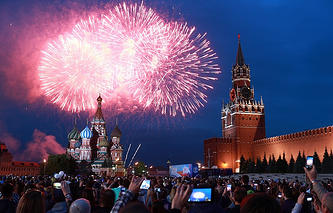 The Russian Foreign Ministry’s official spokeswoman, Maria Zakharova, said on Thursday that the US had failed to officially congratulate Russia on its national holiday to date. The Day of Russia, established by the presidential decree on June 2,1994, celebrates the adoption of the Declaration of State Sovereignty of the Russian Soviet Federative Socialist Republic (RSFSR) on June 12, 1990.